The trader spots a large gap on different exchanges, for example, Bitcoin costs much more on exchange A than it costs at exchange B. 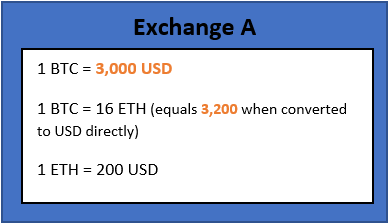 By buying it at exchange B and selling it at exchange A and considering the trading fees, the trader can make a profit. When another cryptocurrency is experiencing high volatility, there might be a gap in the exchange rate to e.g. a fiat currency. The difference to inter-exchange trading is that the trade is performed on the same exchange, only the currencies are different. He starts with having 16 ETH. Now the trader has 16 ETH (the same amount he started his trade with) but an additional 200 USD of profit. Traders sometimes combine both approaches described above. Spotting multiple spreads between exchanges and currencies could, therefore, leverage a higher potential within one single trade. Since trading fees have to be considered, combining two spreads in one arbitrage trade can increase the profits. In this case, the trader not only compares the prices against different currencies (as in intra-exchange trading) but also the differences considering other exchanges price levels. How do traders find arbitrage opportunities? Traders are focusing on fast deals and efficient, risk-lowering calculations. Therefore, they usually build their strategies upon Bots or at least use tools that are supporting them by performing real-time calculations. It is very important to have accurate and new data – specialized platforms like CoinAPI provide a single API to extract market data from a bunch of crypto exchanges. Hence, traders can easily access the latest market data and base their arbitrage calculations on them. It is both possible to manually process the data as well as integrating it into a Bot with the smart API. CoinAPI is providing professional data services for traders. The CoinAPI infrastructure can provide up to 8400 market data updates per second to be used by traders for finding arbitrage opportunities and observing the market. Check out our services on coinapi.io.